Highest Quality“ Our ruggedly constructed lights use no transformers and have the most energy efficient LED drive circuitry in the industry. 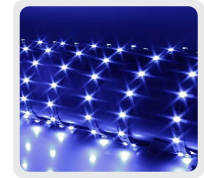 Our lights run directly off 110 volts and produce 109 lumens per watt. Best Warranty -- Most manufacturers offer a 3 to 5 year warranty on their product. The warranty on our patent-pending lights is 10 full years. Local representation -- We always have a factory trained and certified local representative who will personally work with you throughout your project.And, your order comes directly from our factory, with no imports or middle men. Retrofitting your commercial building with our lighting will allow you to go green and save money from day one. Let our representative show you a financial breakdown.